With Kylie on her way to Africa, we were faced with 2 glorious weeks of proper holiday time with my parents. No putting up tents, no dashing for midnight bush wees, hot water on demand and as much wine, cheese and chocolate as you could imagine – bliss! Our 2 week loop started in Fremantle (Freo) an awesome chilled out little town with huge personality. It feels very different to anywhere else i’ve been in Australia, almost foreign, with it’s heritage sandstone buildings, markets, quirky people and it’s famous cappuccino strip – we’ll be glad to go back and and spend some time here before we fly out.We also took a spin over to Rottnest island and hired bikes to go an explore the island – well worth a visit – particularly on Tuesdays when they do half price deals – sweet. 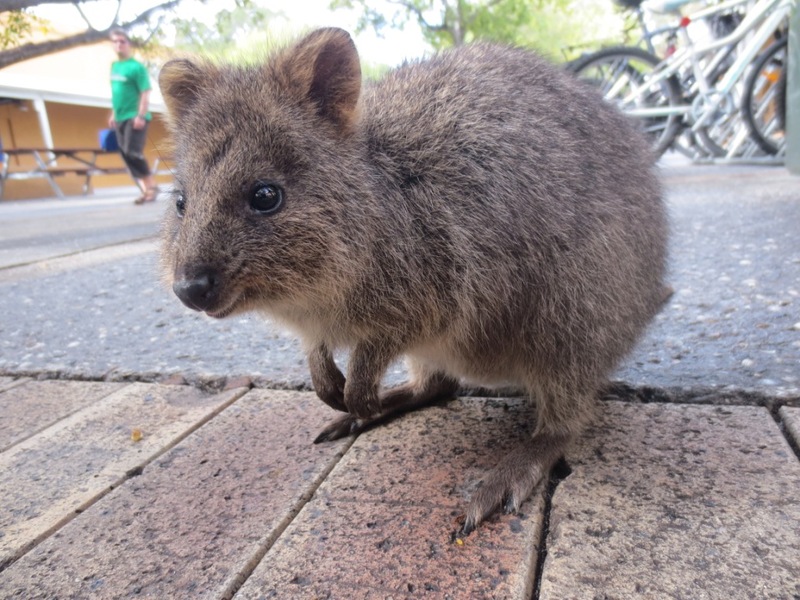 The island is famous for Quokkas, a hopping marsupial which early dutch settlers mistook for rats, and so named the island ‘Rat Nest’ – fortunately they’re much cuter than rats – so have become quite a tourist attraction. We spent the day cycling round the island and despite Mum’s reservations about making it the whole way round, having not been on a bike for 20years,we all made it! Moving onto Margaret River we were bowled over by how amazing it was – beautiful rolling wine countryside right next to the sea – what more could you ask for! The wine here really is top notch and we spent a day on a tour going round some of the smaller vineyards – between us all we built up quite a bounty of wine and chocolate – there were going to be some good times ahead! Well, with it being winter what else are you going to do, when it’s too cold to hit the beach?? We also realised that this would be our last opportunity to fully over-indulge for a long time and so made the most of everything that came our way. It’s fair to say we’ve both packed on a few pounds, but think this is a good strategy to have a little extra padding before we reach Africa, as god knows what we’ll be eating or god forbid what bugs we may encounter. 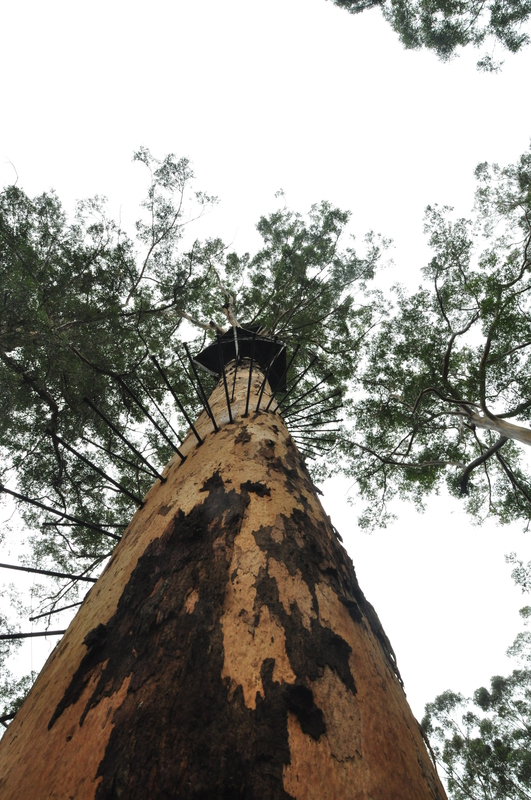 Further south, we headed into Pemberton with it’s forests of huge Karri trees – a couple of which are so tall that they used to be used as fire lookouts. You can still climb up them, so we decided to brave it and have a go. 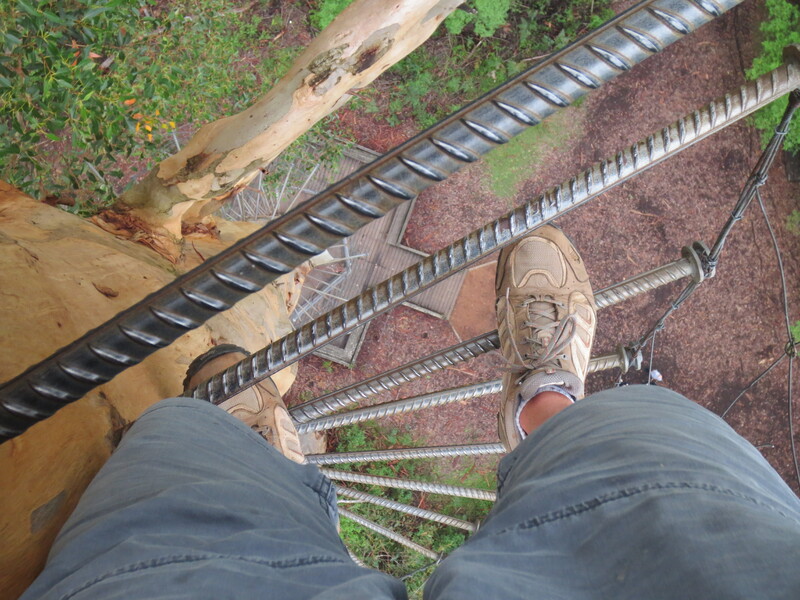 The climbing trees simply have metal spokes sticking out of the trunk that you pull yourself up onto – there are no harnesses, no helmets and nothing to protect you if you were to slip – and at 61m – it’s a long way down! Full of bravado we both began the ascent, but as the ground fell away, the shakes began to start and the legs went like jelly. It was absolutely frightening, but not wanting to look a loser in front of everyone, the only way was to take a deep breath and keep on climbing. The view from the top was unreal, but knowing that i know had to get down off this thing, i didn’t stand around long to admire the scenery. It was pure relief when my feet finally touched the ground – my single tree climb was enough for me, but Rich insisted on going to the Bi Centennial tree which was even higher 75m! After the forests, it was time for the beach again and we spent our last few days down in Denmark & Albany. 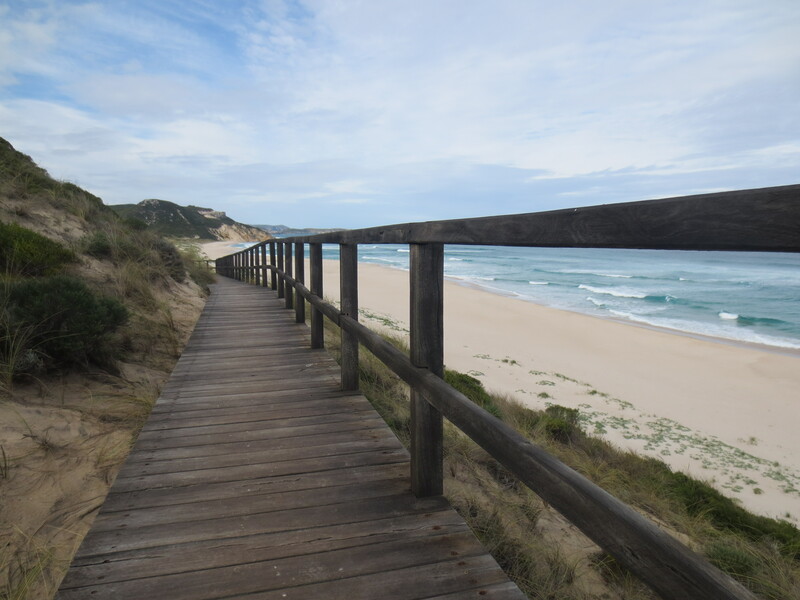 The coastline here, is some of the most beautiful in Australia – Mandalay beach and Elephant Rocks are must sees if you’re down this way – as are the pies in Denmark!!! This area is of great significance for us Bostonians, as this was where Matthew Flinders also heralding from near Boston UK, began to chart the coastline of Australia. It may have been over 200years ago, but he’s still one of the towns biggest celebrities! 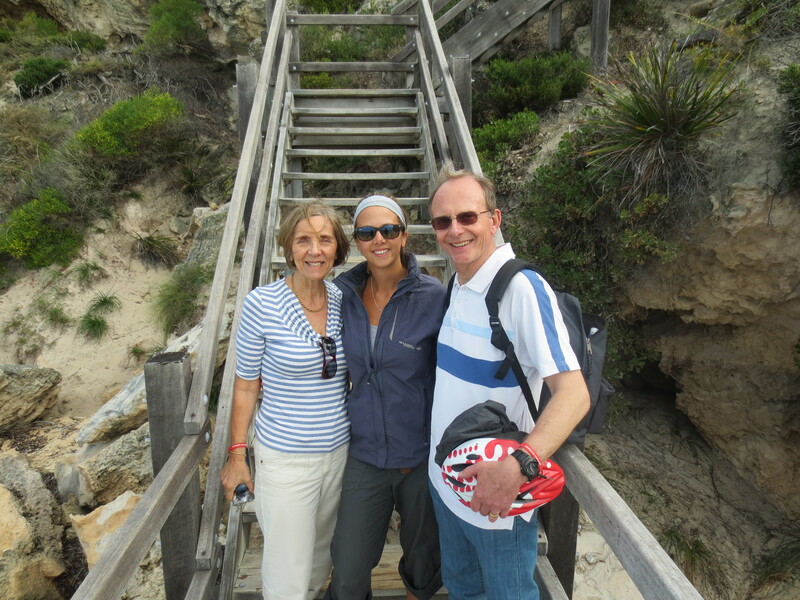 It was a fantastic way to spend our last few weeks in Oz, made even better by being able to share it with family. It’s strange to think that our time in Oz is coming to an end. We’ve had the most wonderful 4.5years – living the most unbelievable lifestyle, seeing so many beautiful places and getting to share it with our amazing friends. Words can’t describe how much we will miss it! But, our sights are firmly set on the next adventure and we are so ready to go now – in 3days time we are going to be flying to Durban!!! Just can’t believe that after a year of thinking, planning & prepping – this is finally happening – we are going to AFRICA!!!! Safe travels,,we will be following your adventures and looking forward to seeing all your pics. Good luck on the next leg guys. Linda and I are winding up our trip in Santiago, we fly to Syd at the weekend! 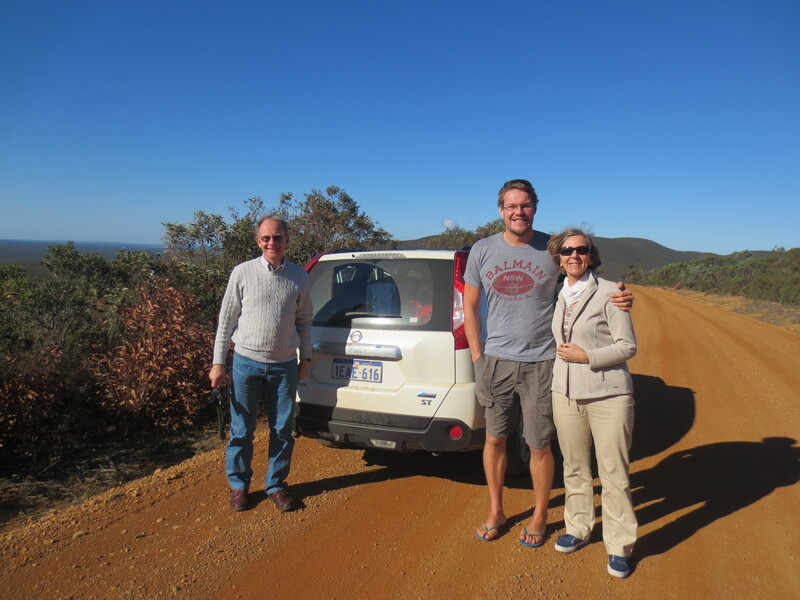 We’ll be eagerly following your blog as you travel through Africa. good luck settling back into work after your trip. The blog was great to follow. We both hope to get so South America one day! In Durban at the moment, it’s such a different vibe to Australia! We can’t wait to get back on the road again. I did one of those tree climbs years ago, it WAS scary …actually I’m a bit surprised you can still climb them, what with all the fuss about OHS nowadays. good luck in Africa !